Calcium gluconate – a mineral Supplement that is used to fill the shortage of calcium in the body and prevention. The tool is available in the form of intravenous solution in ampoules of 1 and 5 ml. In 1 ml contains 0.1 g of calcium gluconate. Calcium gluconate can be used as additional tools in the treatment of allergic diseases, including drug Allergy. Also, the drug is prescribed for nasal, pulmonary, uterine and gastro-intestinal bleeding as an additional hemostatic agent. In cases of poisoning by salts of magnesium and oxalic acid calcium gluconate is used as an antidote. Adult patients the calcium gluconate solution is introduced in a daily dose of 5 to 10 ml every day, every other day or at intervals of 2 days. Single dose intravenous jet introduction should not exceed 5 ml and intravenous drip, it can vary in the range of 5 to 10 ml, Children depending on age appoint 1-5 ml of calcium gluconate after every 2-3 days. Note that when using calcium gluconate vials in the excitation of the sympathetic nervous system increases production of epinephrine, and there is mild diuretic effect. Patients with a tendency to the formation of stones in the urine during the period of use of the drug need to increase the amount of liquid. 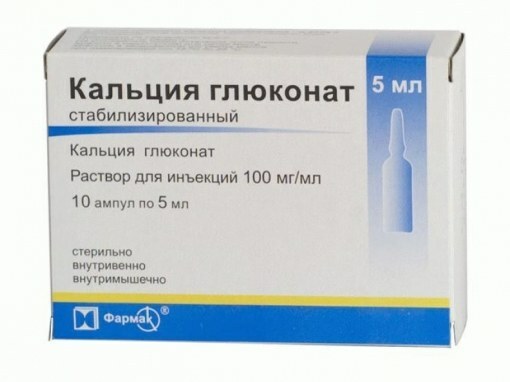 Calcium gluconate ampoule not applied with the increased level of calcium in the blood, severe kidney failure, tendency to thrombosis, increased blood clotting and atherosclerosis. Children contraindicated intramuscular solution. Calcium gluconate ampoule is not recommended to use simultaneously with cardiac glycosides, as their cardiotoxic effects if this combination can significantly increase. The drug is prescribed with caution to patients with minor renal dysfunction, small or hypercalciuria urolithiasis in anamnesis. The presence of these disorders during the application of calcium gluconate is necessary to control the level of excretion of calcium with urine. Side effects of calcium gluconate can manifest as nausea, vomiting, diarrhea and bradycardia. In vnutrimyshechnom a possible tissue necrosis.